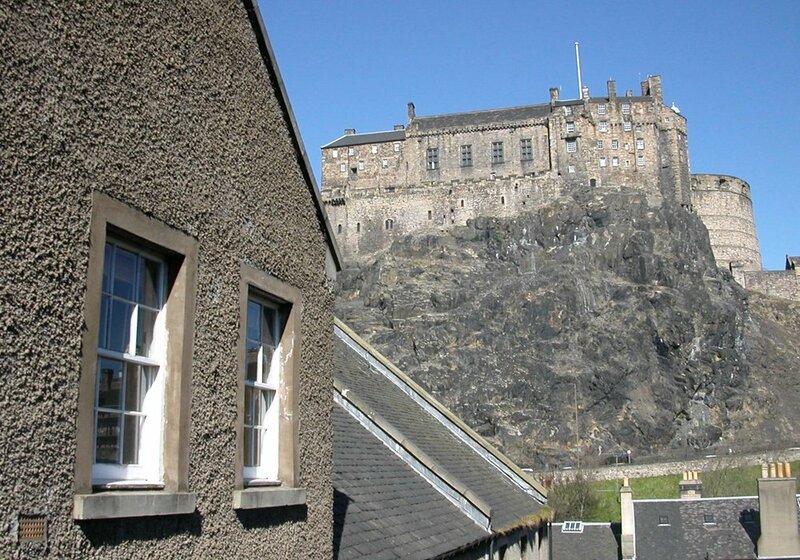 In the Grassmarket, peace and quiet can be hard to come by, so this flat really does enjoy the best of both worlds. 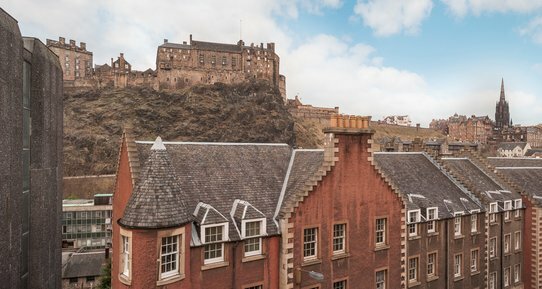 Nestled at the foot of Edinburgh Castle in the heart of the Grassmarket, the flats itself has no windows facing onto the busy square so its amazingly quiet when things get lively. Its part of a secured courtyard so its safe too. In all, a very comfortable way to enjoy all that Scotland's capital city has to offer. This third floor apartment is in a secured and gated complex with wonderful views at every angle. The accommodation has been newly decorated and furnished to make a wonderfully cosy pied a terre in the heart of the ancient city. A comfortable open plan sitting/dining/kitchen has fantastic roofscape views. There is now High Definition TV, DVD and a stereo for our guests. Free secured WiFi is also included. The kitchen has been well-equipped with oven, hob and microwave and plenty of cutlery and crockery for those wishing to dine in though with so much choice on your doorstep we are willing to bet that most will succumb to the temptation of trying a different restaurant every night! There is also a washing machine. Pubs, clubs, pavement cafes and restaurants are all within one minutes walk in this historic area known as the Grassmarket. There is a Sainsbury's Local less than 1 minute walk. 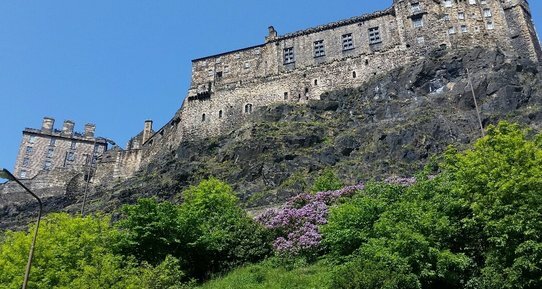 Webstersland is also within easy walking distance of Edinburgh's major sights such as Edinburgh Castle, the historic Royal Mile, Mary King's Close, Hollyrood Palace, Scottish Parliament Building and Scotland's major galleries and museums including the Whisky Heritage museum. It is also within easy walking distance from Edinburgh's principle shopping area, Princes Street. As this apartment is in a gated community, the key is left in a secure location at the flat. Interior layout Lounge / Dining area. Exterior Traditional Edinburgh tenement with NO LIFT. This third floor apartment is in a secured and gated complex with wonderful views at every angle. 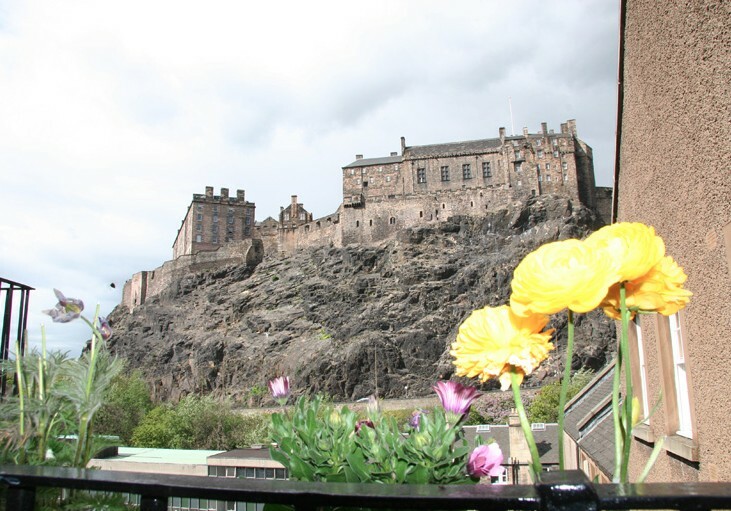 On street metered parking is available in the Grassmarket and there is a NCP multistorey carpark on King Street, less than 5 minutes walk away.